Golden West Exteriors is proud to be among the top 6% of all Edmonton roofing contractors. Don’t trust your biggest asset to just any roofing contractor; choose a GAF Certified Roofing Company. The GAF Weather Stopper Certified Certification enables us to offer every customer the most extensive shingle warranty in the industry. GAF roofing products carry a 50 Year Non-Prorated roofing warranty when installed by a GAF Weather Stopper Certified Roofing Company. 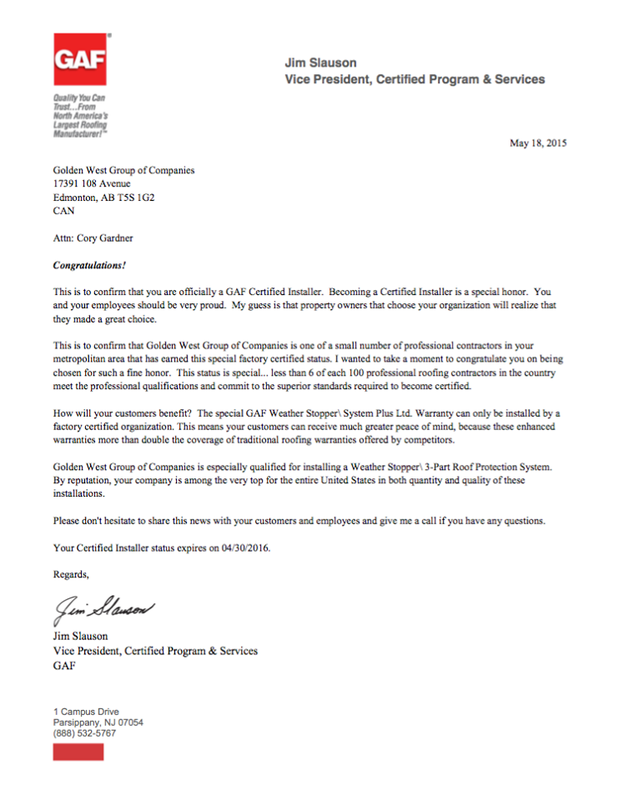 Golden West Exteriors has earned our reputation as one of the premier Roofing and Exteriors contractors in Edmonton. We specialize in GAF Roofing Products and James Hardie Siding Products. We have a firm belief that quality materials, state-of-the-art equipment, experienced, well-trained installers, and a highly educated, no pressure sales team arecritical to supplying our customers with the high-quality, no-hassle home improvement projects they deserve.